Duty Calls started fast and never looked back to win Sunday’s $50,000 Patrick Wood Stakes at Pinnacle Race Course. The two-year-old Service Stripe gelding broke in second, but quickly made his way to the front, a length ahead of Noequal. The pair opened up a length and a half across the backstretch ahead of post time favorite Native Niko in third. Duty Calls began to separate from Noequal heading into the turn, who was joined on the outside by a gaining Native Niko. A length separated Duty Calls and Noequal as the field entered the bend. Five lengths back, Call Me Quincy led the rest of the pack in fourth. Duty Calls exited the turn 2 1/2 lengths ahead of Noequal and Native Niko, who had drawn to even terms behind him. The leader continued to draw clear from his rivals down the stretch and finished 4 3/4 lengths ahead of Native Niko. Noequal could not keep pace with the runner-up, but still held on for third. Duty Calls completed the six furlong race in 1:13.68 over a fast dirt surface with Jeffrey Skerrett in the saddle. He was the third choice in the Patrick Wood at odds of 2.80-to-one. Homebred in Michigan by Mast Thoroughbreds LLC, Duty Calls was saddled by trainer Robert Gorham. The Patrick Wood was Duty Calls’ second win in as many starts for career earnings of $36,100. Baba Booyah bided her time behind a clear-running pace setter and took over in the stretch to win Saturday’s $20,000 Moonbeam Handicap at Pinnacle Race Course. The four-year-old Daylight Savings filly sat in second as Equalitysdebutante launched out to an early and sizable advantage. The leader had a length on Baba Booyah heading into the first turn and stretched it out to four as she headed into the backstretch straightaway. Equalitysdebutante continued to run away from her rivals as they passed the barns and opened up as many as six lengths after a half mile in 47.28 seconds. However, that lead quickly dissipated as she approached the final turn. Equalitysdebutante hung on to a one-length lead over Baba Booyah at the top of the final turn, chased closely by post time favorite Valley Loot, who overcame a troubled start to work her way back into contention. Baba Booyah slowly gained on Equalitysdebutante through the bend and drew even with her rival at the top of the stretch. The pair dueled for a sixteenth of a mile before Baba Booyah disposed of her foe at the eighth pole and was kept to task by jockey Jeffrey Skerrett to draw off for a 5 1/2 length victory. Equalitysdebutante kept on for second, 1 1/4 lengths ahead of Moon Charmer. Baba Booyah completed the one mile race in 1:41.24 over a sealed sloppy dirt surface. She, and stablemate Moon Charmer, left the gates as the field’s third choice in a 4.40-to-one entry. Post time favorite Valley Loot faded to fifth after spending herself getting back into contention. Baba Booyah is owned by Mast Thoroughbreds, LLC and trained by Robert Gorham. She was bred in Michigan by Todd and Carol Weddon. With the score in the Moonbeam, Baba Booyah improved her lifetime record to five wins from 16 starts, including two victories in stakes company. Her career earnings now total $87,530. Baba Booyah was never headed on her way to a half-length victory in Saturday’s $50,000 Michigan Oaks at Pinnacle Race Course. The three-year-old Daylight Savings filly moved quickly to the rail and set an easy pace in the early goings, as City Tour chased from a length behind. The field stayed closely bunched across the backstretch with little change in positions as the opening half mile was set at :50.95. Baba Booyah began to pick up the pace heading into the final turn, as did stablemate Moon Charmer, who quickly overtook City Tour for the second position. Moon Charmer, the post time favorite, began to pressure Baba Booyah through the turn, but she was turned away by the leader, who still held a length’s advantage heading into the stretch. The challenger continued to stage bids throughout the stretch and was repelled with each attempt. As the finish drew near, Moon Charmer began to gain significant ground on Baba Booyah, but could not beat the wire, as Baba Booyah held on for a 1/2 length victory under jockey Jeffrey Skerrett. A late-running Hakuna Matata finished 2 1/2 lengths behind Moon Charmer for third. Baba Booyah completed the 1 1/16 mile race in 1:49.45 over a fast surface. She left the gates as the third choice at odds of 2.30-to-one. Baba Booyah is trained by Bob Gorham for owner Marion Gorham. She was bred in Michigan by Todd and Carol Weddon. The Oaks victory was Baba Booyah’s third win from ten starts, as well as her first stakes triumph. The win increased Baba Booyah’s career earnings to $63,590. Your winner, Baba Booyah (photo from a previous race). During a conversation with Perfect Start’s owner Charlie Williams, he said the three-year-old Jump Start colt had the potential to be the best horse to run under his name. Perfect Start took a major step toward fulfilling that prophecy with a pace-stalking victory in Saturday’s $50,000 Mackinac Handicap at Pinnacle Race Course. Perfect Start stuck to the outside hip of early pacesetter Juggle as the field made its first pass under the wire and into the clubhouse turn, where he then moved inside to the rail. After trying to get around Juggle on the inside failed to produce results, jockey Alexis Ortiz moved Perfect Start sharply to the outside of his rival as the two battled across the backstretch. As this was happening, Juggle began to accelerate heading into the final turn and quickly found himself used up on the lead. Perfect Start capitalized and overtook the leader in the turn. Post time favorite Meadow Wise also began to approach the front on the inside after a ground saving start. A length separated Perfect Start and Meadow Wise at the top of the stretch, as the challenger was urged to gain ground on the leader . However, Perfect Start continued to power ahead of his rival under a right hand whip and prevailed by 1 1/4 lengths. Romeo Again led the second wave of horses and finished four lengths behind Meadow Wise for third place. Early leader Juggle faded to last. The 1 1/16 mile race was completed in 1:47:87 over a fast surface. Perfect Start raced at final odds of 5.10-to-one. Perfect Start is homebred in Michigan by Charlie Williams and trained by Sandra Adkins. With the victory in the Mackinac, Perfect Start improved his lifetime record to three wins in six starts and notched his first stakes win in the process. His career earnings now total $49,570. Your winner, Perfect Start (photo from a previous race). Juggle made an early statement in Michigan’s three-year-old colts and geldings division, holding off stablemate Meadow Wise to win by a nose in Saturday’s $50,000 Lansing Stakes at Pinnacle Race Course. The Elusive Hour colt dueled with post-time favorite Perfect Start for a half mile and pulled clear entering the stretch. Juggle then held off a late charge from Meadow Wise to win the race in 1:13.17 under jockey Jeffrey Skerrett. Longshot Red Bow Tie finished 2 1/2 lengths behind Meadow Wise for third. Perfect Start faded to fourth. Juggle, bred by E.D. Hubel and J.E. Hubel, increased his career earnings to $59,231. The winning exacta was owned by Mast Thoroughbreds LLC and trained by Robert Gorham. The Lansing Stakes was Juggle’s third win from five starts. 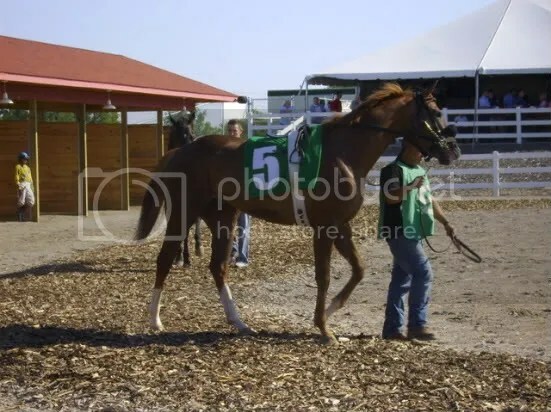 He is two-for-two in 2009, winning an allowance race on Pinnacle’s opening day, June 5. For a chart of the race, click here. Your winner, Juggle (photo taken from a previous race, though it is nice he kept the same number). Dials Corona for Me (2b) holds off Happenedindamoonlite (6) to take the final (and yes, I blew the shot. I’m awful at getting quarter horse finishes with large fields). 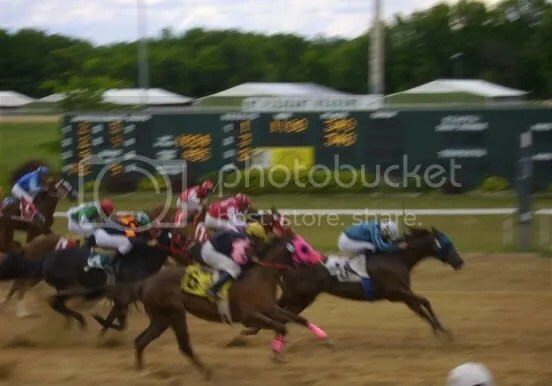 Dials Corona For Me managed to avoid much of the commotion coming out of the gates to take Sunday’s $26,170 Great Lakes Quarter Horse Association Michigan-Bred Futurity by a half length at Mount Pleasant Meadows. The homebred two-year-old Corona for Me filly put a nose ahead of a tight pack coming into the stretch and pulled away as the wire drew near under jockey Oscar Delgado. Dials Corona for Me was joined in her late separation from the pack by Happenedindamoonlite, who finished 3/4 lengths ahead of Cc Cartel to take second in the 300-yard race. Owned and trained by Tony Cunningham, Dials Corona for Me increased her career earnings to $12,317 with the win. The race was the filly’s first victory in three starts, following two third-place finishes earlier this year. Your winner, Dials Corona for Me; Oscar Delgado, up. 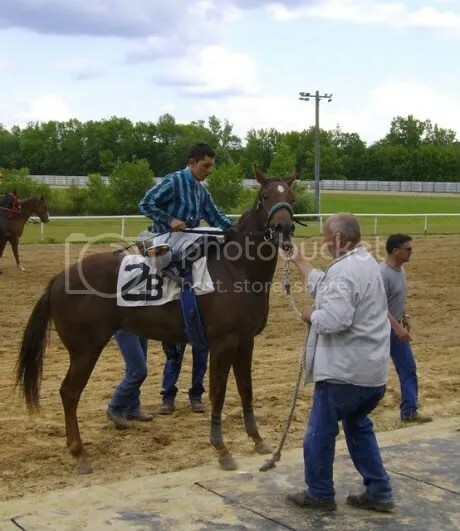 Speaking Michigan-breds in stakes races, 2008 Michigan Thoroughbred of the Year Valley Loot is entered the $75,000 Golden Sylvia Stakes at Mountaineer on Tuesday. Federico Mata gets the assignment (after riding several races at Pinnacle, nonetheless) aboard the second longest morning line choice at 8-1. Fellow 2008 Sire Stakes winner Bipolar Express is also entered in an allowance optional claimer earlier in the card. Can Perfect Start keep his mojo going in the Lansing Stakes? Jockey T.D. Houghton takes the colt out on the track before his first start. Following a convincing 5 1/2-length victory in his first start last Saturday, Perfect Start will look to parlay his success into a stakes win one week later in Saturday’s $50,000 Lansing Stakes at Pinnacle Race Course. The six furlong race is the first major test for Michigan-bred three-year-old colts and geldings at the Detroit racetrack. Perfect Start is one of six horses in the field of seven coming off about a week’s rest after starts on opening weekend. Owned by Charlie Williams and trained by Sandra Adkins, Perfect Start broke his maiden in his first start with a front-running effort at five furlongs. Based on his four straight bullet works at Pinnacle, announcer Matt Hook called the Jump Start colt a budding superstar in the post parade before his maiden win. T.D. Houghton will return from Mountaineer to take the assignment. Also entered is allowance winner Juggle. The Elusive Hour colt also won his season opener, a five furlong allowance contest on opening day, by 5 1/2 lengths. 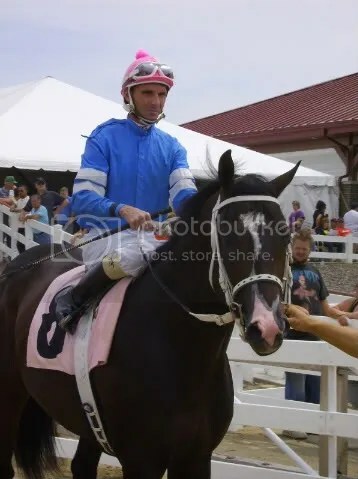 The Robert Gorham-trained Juggle, owned by Mast Thoroughbreds LLC, finished third or better in three starts in his juvenile campaign, including a 6 3/4 maiden win and a third-place effort in the Michigan Sire Stakes two-year-old males division. He will be ridden by Jeffrey Skerrett. Returning from a busy winter and spring is James Jackson trainee Scrimpy. Owned by Millenium Farms, the Scrimshaw colt spent his time away from Pinnacle on the Kentucky circuit, breaking his maiden at Turfway Park on Dec. 31. He comes off a sixth-place finish in a $32,500 claiming race at Arlington Park. Scrimpy will have Men Chen in the saddle. PHOTO ACTION ALERT: It does not look like I will be able to make it to Pinnacle to see the race in person or get pictures. If anyone in attendance for the race would be kind enough to get a picture of the stretch drive and one of the winner and email them to me for the recap, I would be eternally grateful. Selected photos will be credited to the photographer (Don’t worry, I don’t play games with things like that) and if he or she has a personal website they would like me to link to, as long as it’s family friendly, I’ll be glad to do it. For an idea of what I am looking for click here or here. Thanks a bunch!